Ridley Scott follows up the muted reaction to his biblical Exodus: Gods and Kings (2014) and the never-going-to-live-up-to-the-hype Alien (1979) prequel Prometheus (2012) with a return visit to outer space. 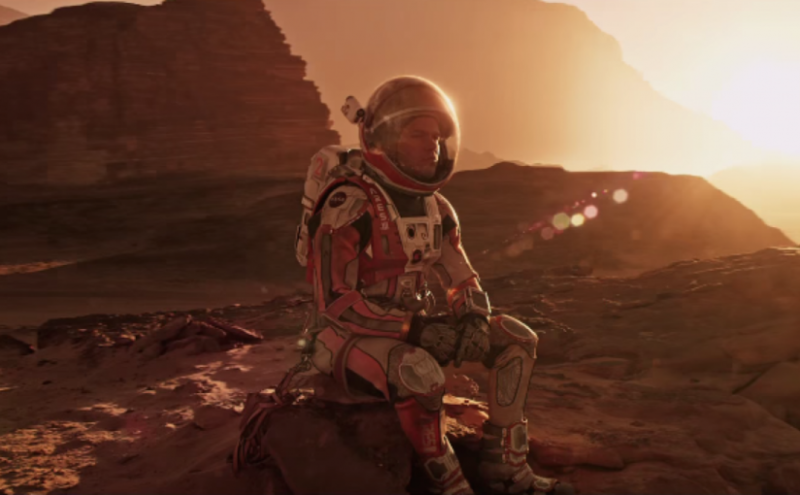 In the light of those earlier outlandish fantasies The Martian feels, ironically, like a more down-to-earth tale. On one of the first manned explorations of Mars (the year is unspecified), Mark Watney (Matt Damon) becomes separated from his team when a violent storm rushes in and forces the crew to abort mission and scarper. His bio-monitor shows no signs of life so they reluctantly blast off with a poignantly empty seat on board. It’s only the monitor that’s been fatally damaged though, and our stranded soul soon comes round, bruised, bothered and bewildered. Left for dead on the red planet. Marooned, in fact. Watney struggles to safety to tend his wounds, while NASA announces his death to a shocked press conference and wider world. And while Lewis (Jessica Chastain) captains her depleted crew back to Earth, her missing scientist is soon recovered and attempting to make primitive contact with mission control back home. Seeing Chastain conquer the stars is oddly cathartic, a residual effect of witnessing her character’s paternal loss to the skies in Nolan’s Interstellar (2014). Chiwetel Ejiofor, puzzling over whether rescue is even possible, is one of the few cast members to successfully convey the import of the situation. Jeff Daniels, Sean Bean and, unexpectedly, Kristen Wiig populate the upper echelons of NASA, but there is something too informal, too relaxed about their interactions. Bean, especially, seems uncomfortably out of place. Wiig is clearly staking an actorly claim beyond her comedic comfort zone. If she is wishing for a pertinent drama with gravitas she need keep searching. Because gravity is lacking from this space epic. Scott’s quest to deliver an uplifting feel-good morality tale from an unimaginably isolating tragedy creates a curiously confused atmosphere. Once Watney has solved the singular issue of his dwindling rations he would appear to be home free, merrily counting down the days, spirits buoyed by the disco playlist his departed crew has left behind. No mention is made of how a lone human would cope with the most extreme solitude, the agoraphobia, the abandonment; concepts so eloquently tackled in the superior Moon (2009). A mission to Mars would naturally require a personality brimming with the mythical ‘right stuff’ famously demanded of astronauts, and Damon is well cast to convey such strength of character. But one yearns for a single convincing touch of darkness, of struggle, of battling the inevitable psychological demons. Fiction demands the willing suspension of disbelief of course, but here an all-pervading tone of cheerful breeziness results in an absence of impact. Inhabiting the space where Gravity (2013) intersects with Cast Away (2000), The Martian is an enjoyable and fun far-fetched yarn. Particularly, one cannot help get tangled up in a finely gripping climax. But the lightness of tone throughout remains at odds with the uniquely momentous premise. Matt Damon is left to his own red dead redemption. We leave the cinema with a strangely inappropriate weightlessness.